Gov. 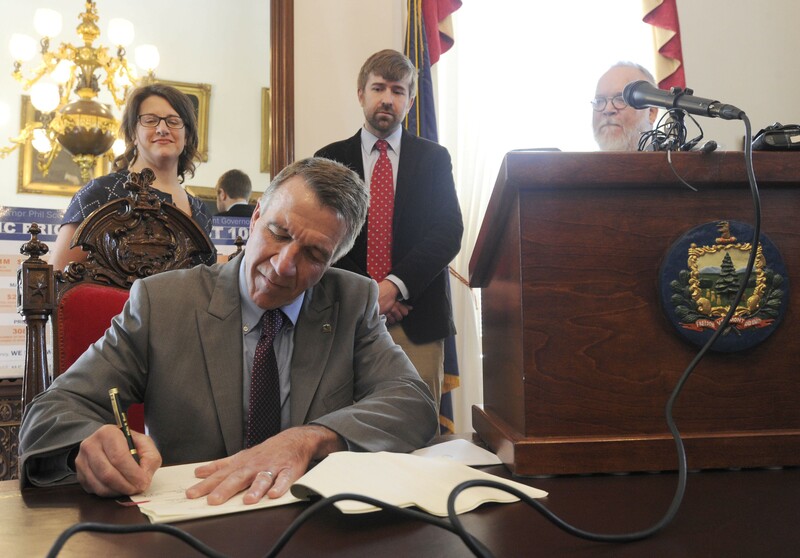 Phil Scott, surrounded by journalists, signs the shield bill into law. Here's a valuable lesson for politicians: The best way to get maximum media coverage for a bill signing is to sign a bill that affects the media. The governor's ceremonial office was unusually crowded Wednesday morning as Gov. Phil Scott signed S.96, the media shield bill, into law. The bill, which sailed through the legislature with very little opposition, will protect journalists from being forced to reveal confidential sources or release unpublished material. Vermont becomes the 41st state to afford such protections to reporters. "[The bill] creates a new statutory privilege protecting journalists from the compelled disclosure of confidential sources or other information received in confidence," Scott said. "This protection enables sources, from whistleblowers to victims of a crime, to feel confident in their ability to speak freely to the press." After a brief statement, Scott turned over the podium to Seven Days political editor Paul Heintz, who spoke as a representative of the Vermont Press Association. He expressed appreciation for the legislature's willingness to tackle a potentially thorny issue, and for the lack of real sustained opposition. "We were really happy with how much the judicial system actually supported this bill," he said. "I think they recognized that we were just catching up with other states here." Heintz himself had seen firsthand the potential consequences of working in a state without media shield protection. He, along with two colleagues at Seven Days, were subpoenaed by the prosecution in the sexual assault case of former senator Norm McAllister, and ordered to turn over all material related to their coverage of his case. After the signing ceremony, the governor gave his actual signing pen to Heintz as a memento. We trust that his incorruptible nature will prevent our colleague from being unduly influenced by the gesture.